Elderly people who live in nursing homes suffer some social and health problems, given that they often feel unloved, they have trouble communicating with others and they end up feeling lonely and isolated and without much mental stimulation. Elderly people who live in nursing homes suffer certain social and health problems because they often feel unloved, they have trouble communicating with others and they end up feeling lonely and isolated and without much mental stimulation. Dogs and also cats show their affection with all their heart, regardless of the age, physique, mental health or personality of the person. Dogs, cats or other pets will draw attention due to their movements, their display of games and affection. This will motivate elderly people and arouse their interest. Affectionate contact is something that many elderly people can miss. Pets are warm and loving beings that can be petted, touched or hugged, which seems to help in reducing stress and promoting health in general. Watching a cat or dog will bring us memories of situations with pets in the past. Remembering old times is positive for elderly people. Elderly people have few opportunities to play, but an affectionate pet can help them give free rein to their playful instincts. Many elderly people lack stimulation, given that television is usually the only entertainment and it is very passive. A pet will attract everyone's attention and will provide mental stimulation through the sense of sight, touch, smell and hearing. On many occasions pets have proven to facilitate social contact, and this can be useful for elderly people who live in a nursing home or who live alone. Elderly people also have fewer opportunities to laugh. Dogs will always do something strange or funny and will cause laughter in those who hadn't smiled in a long time. In many countries all over the world, including Spain, therapies for elderly people include pets. Some nursing homes have their own pets, which are usually cats or fish in an aquarium, because dogs need much more care and attention. Thanks to the wide variety of benefits, this therapy has been accepted immediately. 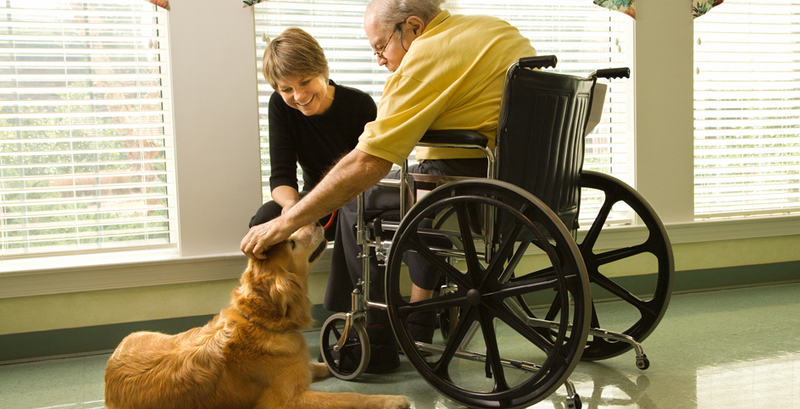 Nursing homes are increasingly more willing to have programmes with pets. The term «therapy assisted by animals» is used to define this medical approach. In many countries there are authorised programmes for the volunteers' cats and dogs, so this is becoming an increasingly accepted method to help improve the life of our elderly.